April | 2010 | Words. Sentences. Stuff. Soo Wee Syde Grlz has been bought by DF Underground and will feature in a future edition. Album of the Year has been picked up by Jersey Devil Press and features in their current issue. Regular readers may remember that they published The Boy Who Threw Rocks at Trains at the end of last year. Jersey Devil is a great journal and I’m not just saying that because I’ve had stories in a couple of editions. Consider yourself duly encouraged to go have look. So there you have it. A couple of bits of short-story related news. So says everyone Ewan McGregor meets in the first half hour of the new Roman Polanksi film, but that’s not quite the case. If Ewan McGregor’s in it, we can be sure we’re letting ourselves in for two things: his accent will be unconvincing unless he’s doing posh Scottish and he’ll be getting his arse out at some point. Check and check. 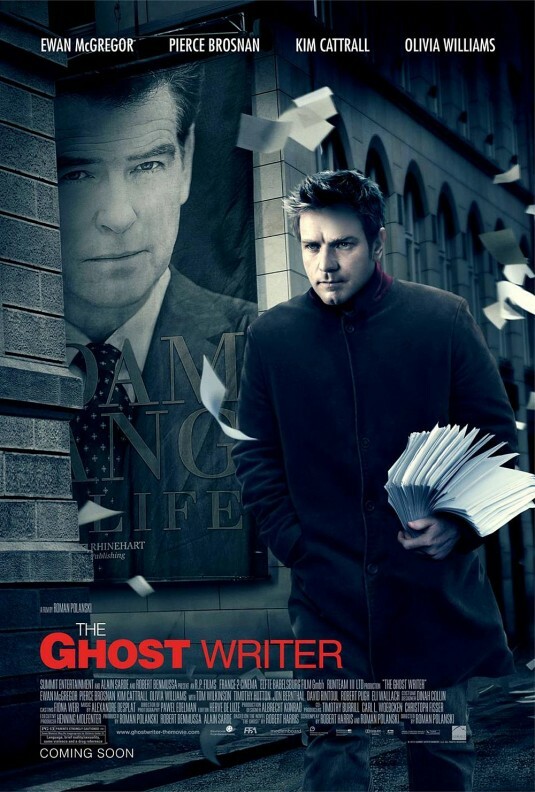 McGregor is the titual Ghost, or Ghost Writer if you don’t happen to live in Europe, otherwise unnamed and hired to help former-PM Tony Blair Adam Lang re-write his auto-biography, following the death of the original ghost writer who’d churned out a boring mess. But in a twist reminiscent of when Louis Theroux met The Hamiltons, an already dubious assignment goes further belly up for McGregor when it transpires that Lang (a ministerial Pierce Brosnan) had been a naughty boy when he was in power and indirectly kidnapped and tortured a couple of British-born terrorist suspects. Lang, his aides and his wife, Cherie Ruth (the excellent Olivia Williams), have holed themselves up in an elaborate compound on an island in Martha’s Vineyard so that’s where The Ghost ends up and it’s here that most of the drama takes place. The drained palette suddenly feels in place and the metaphorical storm that’s brewing is mirrored in the actual climatic conditions over the ocean and dunes. It’s not long before the writing aspects of the assignment fall by the wayside and it’s all about getting to the bottom of the host of mysterious happenstances that saw the demise of the original ghost-writer, the sudden airing of the torture revelations, Ruth’s reasons for being so tetchy, why such an inconscpicuous and boring memoir is given its own wing of security and what the shadowy company of Haliburton Hatherton has to do with anything … because who knows? They might all be related. Soon, not content with the weather metaphor, the actual island and isolation of the compound come to represent Polanski’s Lang’s isolation from his home. Polanksi’s in full Hitchcock mode here and the mystery and conspiracy of something like North By Northwest has clearly been an influence. For the most part, it’s sort of entertaining. The cast and the script do enough to inject some fun into the affair but from James Belushi’s opening cameo through to Kim Catrall through to Robert Pugh, there’s the sense that everyone’s operating well beneath their optimum levels. No one seems particularly pushed by any of this. That said, everyone loves a conspiracy and when the film leaves the island to move into Pelican Brief territory towards the end, it certainly does so surfing on the back of a suspicously tense wave. The end itself, however, is awful. For the best part of two hours, Polanksi nudges the threads of intrigue forward, drops in a few discoveries that generate as many questions as answers, builds towards a ringing crescendo … but then he forgets to put in the masterful reveal that leaves the audience breathless. Instead, we’re left with a trite device that would have Dan Brown shaking his head as he pounded the delete button, the unmasking of a baddie so obviously bad they might as well have had the union card stuck to their lapel and an MO with a sadly perplexed and over-emphasised, oh. Finally, I don’t mind swearing. I really don’t. I’ve been known to swear myself once or twice. But out of perhaps twenty instances of the f-word, at least half of them are the result of a character doing the equivalent of stubbing their toe on the corner of the bed, or finding they don’t have mobile phone coverage or realising they’ve run out of milk. It adds a level of gritty realism, I suppose, which would be fine if the film was grittily realistic. I do so hope that Polanksi has another film in him. The private man is one thing, but he’s always been a director I’ve enjoyed and if the final scene he was direct was to end up being the one in this movie, it would be an unremarkable, damp squib close to a career.